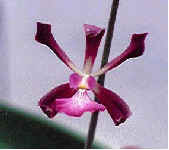 Cattleya, Bc., Blc., Lc., Encyclia, Epidendrum, Etc. These plants prefer a fairly strong filtered light. Under an Oak tree is a good spot for these. Most like temperatures with a high in the mid 90’s+ and lows as low as 50. The large temperature swings of winter help them to bloom. They bloom on new pseudobulbs after forming a sheath which looks like a forming leaf that the buds grow in. Water every few days and fertilize every week. 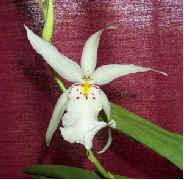 The flowers are typically fragrant and many are very large. Re-pot once a year if needed when new growth is getting roots. Cut in sections of 3 or more pseudobulbs and use a pot clip or wire to hold the divisions firm in the pot until they have rooted thoroughly in the new pot. There are many types that require different conditions. The typical ones you would have bloom when the plant has leaves and get rather tall. These plant will lean to the most light it can find. For the best plants keep well lit from above with strong filtered light. These like to get a bit chilly most do well going as low as 45 (some to 40) at night and highs in the 90‘s. This is one of the reasons these are so common. See the bottom of the page for watering info. Keiki's are common, a small plant growing on side of a pseudobulb. Another neat thing about Dendrobiums is that after the old pseudobulbs are done you can remove them and cut them up in sections of 2 or 3 internodes and place them on there sides in sand or sphagnum. Known as the "Dancing Lady" this is a wonderful little plant that gets a lot of flowers several are scented. A very popular Oncidium is "Sherry Baby", this one smells like chocolate! I lost a very nice little Oncidium a while back from keeping it too wet. A bunch of the Oncidium orchids get hundreds of flowers at a time. They like medium light and good air movement. Most require a period of not watering for a while after flowering. See our BLOOM LIST for more! Low temp about 50.